The dinner was fabulous and the company was great. The wine flowed freely and the location for the dinner was perfect. We began the evening walking through the host’s garden (thank you Cathi and Dennis). It was a beautiful summer evening and when we left the garden, we came into the appetizer course, Bruschetta. It was a perfect dish full of fresh flavors and the more colors, the better the flavor. It is a quick and easy recipe for anytime, especially for summer parties. We had both a cold version and a warmed one. Delicious! Dice everything and toss in a bowl. Mix in the olive oil and pepper. Refrigerate. If hot, spread butter and garlic on bread. Toast in oven. 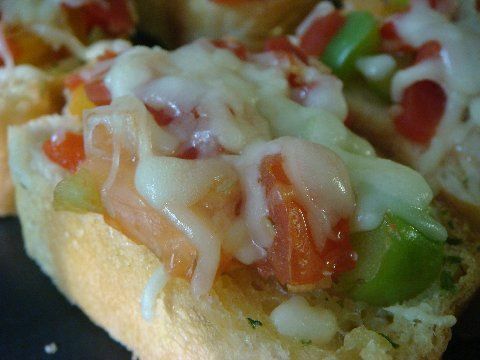 Spoon bruschetta on top of each slice of bread, add mozzarella cheese. Return to the oven until cheese is melted. 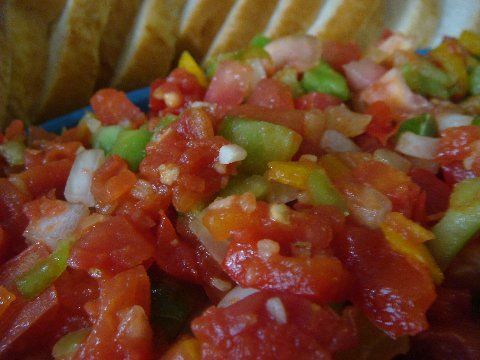 If serving cold, place bruschetta in serving dish for guests to spoon onto bread.